Intelligent Recording has a wide range of hardware and software platforms that are designed to meet everything from basic call recording requirements to providing a turn-key system that records calls, upsells your clients and aids in staff training and development. We support a variety of operations with units capable of recording 1 to 32 lines. Analog recorders can be set to voice-activated mode to record radio equipment, handsets or phone systems such as Meridian Digital Centrex (through a Dees CRI-376 Recording Interface). The single-line recorders use a USB connection to a local PC for communication and power. 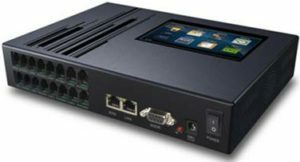 Models are available for analog, IP, or digital phone systems. ‘Desktop’ units make installation easy with standard telephone jacks in and out. The CT multi-line analog units (4 or 8 lines) can operate stand-alone or networked to allow remote storage and retrieval. Hundreds of hours of calls can be stored on a removable SD memory card, or configure it to store calls on a remote PC.. The ‘Call Caddy’ option will queue calls, play promotions and take messages in professional offices. Ask about the CC-4 and CC-8. Just attach a network cable and plug in the power adapter. Install the included software on a networked PC (Windows 10, 8 or 7) to manage recordings remotely. ‘Rack-mount’ CTP units are available in 8-line increments up to 32 lines. A 1TB hard drive stores calls locally, and the network connection allows remote storage and retrieval. CTP units come with brackets and are intended to be installed in the equipment room. Provided connectors fan out to an RJ-11 jack for each line. From here you simply bridge the lines that are to be recorded. These are usually Central Office lines so incoming Caller-ID can be collected. SMDR is supported so the recorder can associate extension numbers with calls. Captured calls can be stored on a networked PC or on our Cloud with secure access. Individual recordings can be saved in standard high-quality formats and shared with colleagues. CC-08 Stand-alone desktop – Stores calls on SD Card or networked PC. RJ-11 jacks make installation easy. 4-line and 8-line models available. Call Caddy option adds call answer and queuing features. CTP-32 Rack-mount stand-alone – Includes hard-drive and touch-screen. Connects to punch-down block in equipment room. 8- thru 32-line models available. Click on the Model name for a pdf brochure. Please contact Dees for further details. Dees Communications Corporation is an authorized Dealer for Intelligent Recording products.